Deep in the lush Mekong River delta, rice paddies are carved into mountainsides in serene terraces of green. In this bucolic setting, the work of a rice farmer was hard, back-breaking. Threshing, the process which releases the rice from the stalk, was done by hand. The whole kernels, after being separated from those that have shattered, were sold for a meager profit, usually to the colonial aristocracy in what was French Indochina. The broken pieces, however, were kept for home consumption, or sold cheap to fellow laborers. Because of this, broken rice, or com tam, became the day-to-day sustenance for the peasant class, steamed to humble platefuls, and eaten with simply-grilled meats, fresh cut vegetables, and a bowl of sweetened fish sauce called nuoc cham. Here in present-day Garden Grove, deep in Orange County's Little Saigon, virtually every restaurant and pho joint has a version of this Vietnamese work-a-day dish, but few actually specialize in it like Com Tam Thuan Kieu, a plain-looking place located in a dingy strip mall indistinguishable from all the other dingy strip malls along Brookhurst Street. Out front, toothless, chain-smoking old men sit and chat, no doubt reminiscing about a time in recent history when Ho Chi Minh City was still called Saigon. Inside, the menu -- which features broken rice and meat pairings in sixty-four permutations -- is dizzying. The specialty of the house is #7 and #8 on the roster, two dishes which takes the name of the restaurant itself. Com Tam Thuan Kieu 7 mon A ($7.95) and Com Tam Thuan Kieu 7 mon B ($7.95) are masterpieces of seven mouth-watering items heaped on top of a generous mound of rice. It's a meal fit for a fat French Imperalist or a family of hungry rice planters. Seriously, it is enough food to feed two people at one sitting, or one person for two days. Bi (Shredded Pork) - Wispy strands of translucent pork skin and julienned meat tossed with toasted rice powder. Cha (Baked Egg) - A slice of something similar to quiche, with wood ear mushrooms, glass noodles, and pork cooked together with beaten egg. Nem (Charbroiled Meat) - A mixture of pureed pork meat, aggresively seasoned with pepper, formed into racquetball-sized spheres, and cooked to a springy, bouncy firmness. Lap Xuong (Sausage) - Sweet Chinese sausage, splayed on the diagonal into bite-sized sections, pan-fried to an oily sheen. Tom Nuong (Charbroiled Shrimp) - Grilled shrimp skewered on a stick, basted with a sweet barbecue glaze. Tau Hu Ky (Bean Curd Skin w/Shrimp) - A golden brick made of shrimp minced to a paste, wrapped with a thin sheet of bean curd skin, and deep fried crisp. Suon (Charbroiled Pork Chop) - A grilled, marinated pork chop, cut to the shape of a baseball mit. The rice, steamed perfectly to pleasingly-perky, pebble-shaped granules, acts as a blank canvas for the protein piled upon it. The short stubby pieces form a matrix well suited to sop up the juices that leech out from the meats, the oil-wilted scallions, and Thuan Kieu's Nuoc Cham, a pungent sauce with vinegary, sweet, and fishy overtones, meant to be drizzled over everything you eat. The Nuoc Cham -- garnished with pickled pearl onion bulbs -- is the heart and soul of the dish. Com Tam without it, is pancakes without syrup; cereal without milk; sushi without wasabi...you get the picture. 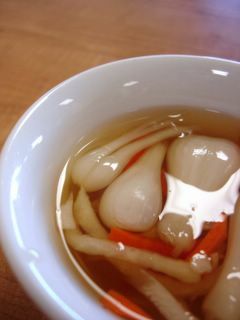 Palate cleansers in the form of thickly sliced cucumber and pickled carrot provide a fresh counter balance to the meal. 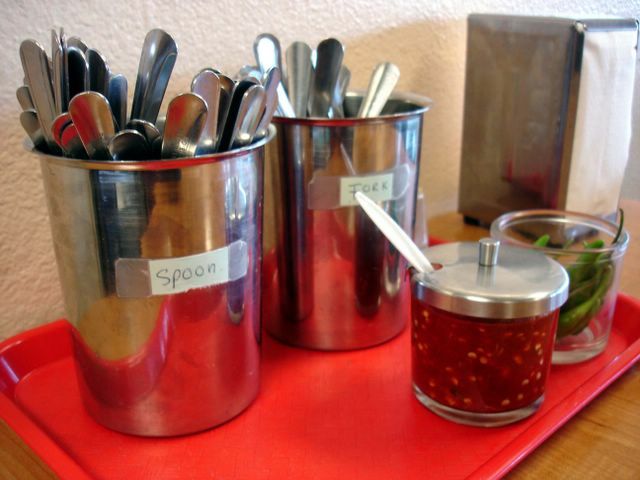 But true com tam aficionados won't overlook the whole Thai chili peppers, offered on each table next to the spoon and fork receptacles. For every spoonful of food, bite off a piece of the chili as you would a dill pickle. It's a scorching ordeal, but essential for the full experience. Dissipate the resulting burn with a sip of the broth, served with every plate of com tam. Its flecked with chopped scallions and sweetened with deep-fried shallots. If you're lucky, the soup will also come with a chunk of gristly pork from the stock pot. For a less gut-busting lunch, opt for the #22, Com Tam Bi Cha Thit ($4.95) which includes the familiar trio of "baked egg cake", "shredded pork", and Thit, charbroiled pork marinated to a deep shade of rouge. The pieces are as tender as they are flavorful. But whatever you order at Com Tam Thuan Kieu, heed the first two words on its name and don't ask for pho. 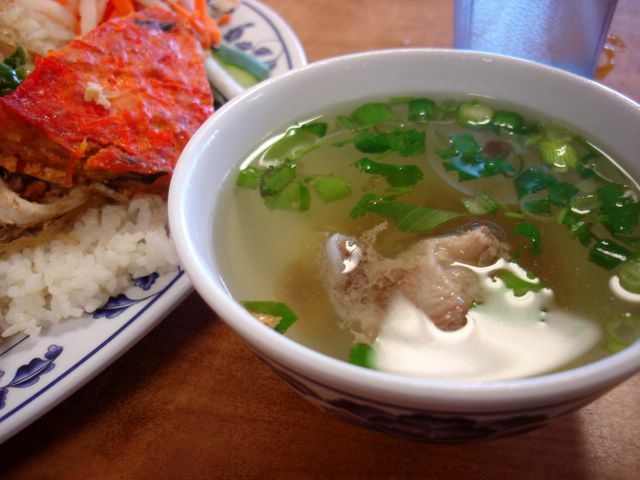 Post-script: Read Chubbypanda's review of Com Tam Thuan Kieu here! As I was trying to say before, I love Vietnamese food, and am always willing to try new dishes. Especially if there are hot peppers involved. Awesome! Another lunch place! I'll be sure to check it out and let you know what I think. The thit captured in that plate of Com Tam Bi Cha Thit almost makes me want to revisit the current "hate" status of my ongoing Love/Hate relationship with Viet food. The pieces look delectable. And your subliminal characterization of them as "rouge" [French colonization of Vietnam: major events of the 20th Century] was great! So you got pork in your broth, huh? Is that as rare as the "Daily Double" on Jeopardy? I hope not. Seriously, the shade of the broth looks great. Filipino fast food...broken rice joints patronized by the county's toothless...Elmo, you ROCK. P.S. -- Do I sense the word "katsu" may be forthcoming in a future post as the Monster Munching Pacific/Mekong phase progresses? Ahhh, you make me homesick! My grandma would always prepare com tam at home with the suon, bi and baked egg - how you make me miss it! :) Fantastic post - hunger on the part of your readers is a sure sign of success! This is why you are such a great Chowhound. You found a great place for a meal that features a bounty of tastiness for just a few dollars from the wallet or purse. Despite the trend these days to feature the hip or trend-setting vestibules of supposedly good food, you find the places that the average person would love to go to for a lunch or just an ethnic experience. It is one of the reasons I turn to your blog and fondly remember how you turned me on to food blogging. Have you tried Quan Hey (Spelling?). They offer Hue cuisine which is central vietnamese food. Nice and rather different. Sorry about Blogger misbehavin'. Seems to happen a lot lately! Anyway, everything does seems so much tastier when raw hot Thai chili peppers are brought into the mix! There was some chili paste on that table too which I used sparingly since I didn't want to punish my stomach for what my mouth wanted. I hope you like it! If you try the monstrous plate of 7, be sure to have someone with you to share...otherwise you'll have more leftovers to add to your collection. LOL! I sometimes think this blog is beginning to sound like a vicarious trip through South East Asia by way of Orange County and its neighboring cities. But you are correct sir, your katsu tip is what I'm going with next! Lucky! You got to grow up with this stuff! I've been trying to find a good recipe for a Suon marinade. If I can nail that down then maybe I can try my hand at making bi, and the baked egg! Thanks for your kind words. It is these type of places that I love most. Cheap, honest grub where flavorful food in enormous amounts triumphs over atmosphere. Contrast this with an abomination called Crustacean in Beverly Hills -- I don't even have the energy to recount my horrible experience there. Don't get me wrong though, I like fancy places too, but only if the food rises to the level of the cost and surroundings. Anyway, I digress! Thanks again for always leaving such nice comments! Quan Hy and its sister Quan Hop is on my ever growing list! Man, how am I ever going to keep up. OC has so many great restaurants! You should give Van Restaurant a try... they have great (and cheap!) com tam, bun rieu, and banh xeo (their specialty!). I think you would enjoy it. Hey Elmo - Looks quite good - it's so very hard to find Com Tam Dac Biet where all of the items are good! What a beautiful post Elmo! I can completely visualize the gorgeous and "serene" images of Southeast Asia. Also, those pictures are fabulous! Just tried it for lunch with a Vietnamese friend of mine. I got the #8. It's pretty good, but you were right; it's huge. I've got about two thirds of it in a box in the office fridge. Cat is going to have a biiiiiiig dinner tonight. Those chilies weren't too bad. I had about seven. The palate cleansers are really good at shutting down the heat when you've had enough. Thanks for the tip! I'm still on a quest for Bun Rieu. My one and only experience a few months ago has not deterred me. I'll definitely add this on my long, long, long, long, long list of places to try next. Although the pork chop (suon) was the weak in flavor when I took my first bite (compared to the Thit), it was for some reason, better the next day as leftovers...and I'm not sure why! Thanks PE! Always value your comments! Thankfully, no one was in the restaurant as I took the pictures, so I got no stares. Plus I was extra discreet. Wow that was fast! I was eyeing the #8 because of the cha gio. I love that stuff, but then, because I love Chinese sausages even more, I took the #7. As I was saying to Kirk, for some reason, the leftovers taste better the next day. Maybe because scarcity makes everything tastes better. Broken rice with nuoc cham is one of my favorite things. I'm pretty sure none of the Westside Vietnamese places have it, though. Yet you can get it in St. Louis. Go figure. Funny I was searching Google for existing reviews on Com Tam Thuan Kieu and it turns out Jonathan Gold himself tried the one in San Gabriel. But that is quite a ways from the Westside. I can't wait to read your review!!! 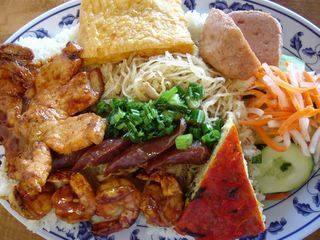 You should try Com Tam Tran Quy Cap. It's in the Bolsa Mini Mall (where Thanh My is located). Look in the right corner of the strip mall where the yellow umbrellas are, next to the nail salon and fabric store. I think their marinades are excellent and their shrimp in tofu skin is awesome too. Also, you can usually just ask to have one or two eggrolls added for a buck or so, or substitute for something else in the combos. And instead of com tam, try banh hoi (steamed vermicelli sheets. And the bun rieu oc at Vien Dong is very good. You're a much better food blogger than me. I tried but I'm too lazy to take photos and write about what I eat. P.S. The bottled Pagolac sold in grocery stores is also a pretty good thit suon marinade. 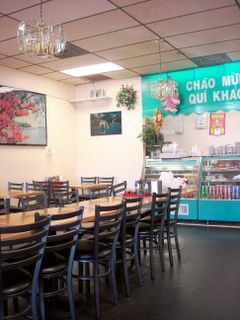 Oh yeah, have you ever been to Dong Khanh off of bolsa btw brookhurst and ward? Awesome cheap home cookin' that's open until 3 AM. Food looks yummy! 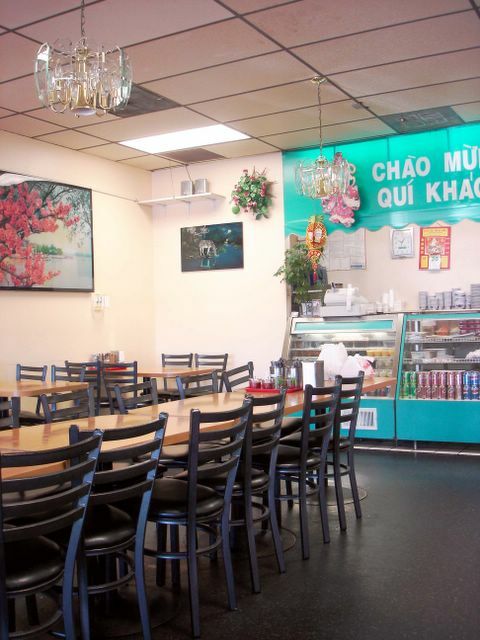 I know there's another location on Brookhurst near Westminster Ave. That one is more dingy then this one and the food was good BUT for better Com Tam, you gotta try Com Tam Tran Quy Cap on Bolsa right near that Asian Garden Mall (Westminster). Their food is more delicious than this place. I have friends from out-of-state who always asked me to take them there. Thanks for the com tam lead! I will definitely have to investigate that as well as the marinade! The one thing about I don't like about marinading my own pork chop is making the marinade...short cuts that achieve the same desired result is exactly what I need. Thanks! Thanks for writing in! We might have been at Com Tam Thuan Kieu at the same time. Although I don't think you could've missed me eventhough I was trying to be discreet with my camera. Home cooking at Dong Khanh and it's open late *AND* cheap? Awesome! What do you recommend there? Thanks! That's two votes for Com Tam Tran Quy Cap. You hear that Chubbypanda? I think we've got us a Com Tam Battle! Arr'h kizinn! Thank you for leaving a note! Because of it, I just discovered your blog! 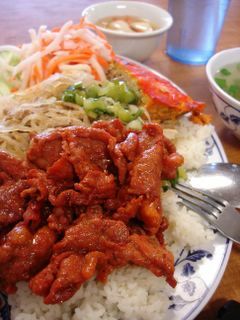 I just went to Com Tam Thuan Kieu in San Gabriel this weekend with a friend who had a craving. Their shrimp cake in bean curd is definitely not as good as Tran Quy Cap. Then I looked at your photo again to confirm. Tran Quy Cap's shrimp cake is meatier and more flavorful. But I have to admit, the eggrolls at Thuan Kieu are much better. A light flaky outer layer, longer pieces, and what I suspect are also real crab in the filling like they make at the good bun cha places in Hanoi. Or that's how the eggrolls are at the San Gabriel location anyway. But for overall Com Tam? My friend and I still say Tran Quy Cap is best. Haha! Too bad I was busy eating instead of snapping pictures or else I could have posted pictures for comparison. I think it's a sweep. TQZ has certainly got my attention now! put the rice alone on a baking sheet and put it in oven at 400 for 10 minutes or until it gets crunchy (it'll actually pop like popcorn). reheat the meat and the other "toppings" in the microwave or in the oven then pour the "nuoc mam" which means fish sauce (that's what they use to make the sauce). btw, "nuoc cham" means dipping sauce. they call it "nuoc cham" when they serve it with egg rolls because you dip the eggs roll in the sauce. so you should really call it "nuoc mam". Just a minor correction. Happy eating! I just feel so lucky because...I know how to make Com Tam! ahhahaah. Great tips! Except I NEVER have any leftover com tam. Always finish every grain. LOL! I took your recommendation on Com Tam Thuan Kieu but it is only okay. I tried the following from orange county food blog and it is soooo much better taste wise and food wise. I absolutely love broken rice. I tried it for the first time a couple of years ago. It was served with a fried egg, shredded pork, tomato sliced fresh, cucumber, sausage and a pork chop fried. It changed my life...well not the the extent that you think...I didnt become addicted but I did discover a new meal to order on the way home or try and make myself.